Summer in Dubai might be a bit boring. With temperature ranging between 40 and 50 degrees during the day, there are few things to do during the weekends. You might stay home and relax, maybe inviting some friends over for a drink or lunch. You might go to the Mall or the Cinema or try something else indoor like an exhibition, event, gym session. The swimming pool could be a good option if the heat is not that strong, but it is not really enjoyable as in the good season. We have tried everything and discarded the Mall option, since in the weekends is usually packed and the swimming pool because crowded and too hot to really relax and enjoy. In our desperate research of something interesting to do, we found a Escape Quest recently opened in Cluster M – JLT, very close to our Cluster. We have tried a similar one before in Sunset Mall and we liked the concept, even thought the quizzes and puzzles we had to solve the last time, where sometimes illogical and difficult to understand. 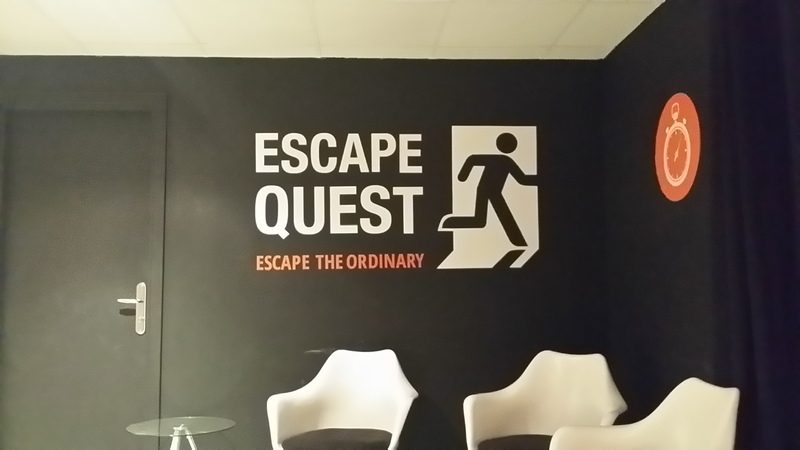 The Escape Quest welcome room where the owner explains rules and spirit of the game. This time we were welcomed by two energetic people that explained the rules and what we should expect to find inside the room. I am not going to disclose any trick or anticipate any trouble we had, just note that: (i) In the room you have everything you need; (ii) usually the easiest way to see a thing is the right one; (iii) you have some helps available. Basically you will be requested to use some clue to generate a code to open a series of locks that will lead you, eventually, to open the door and escape before the given time of 1 hour. We enjoyed The Explorer’s Library quest that is introduced as follows. The nice touch is that the hints are provided through a TV installed in the room and sometimes, if you are completely lost and wasting time in something useless, the owner (who sees you through the security camera) communicates with you via TV. Very funny and challenging. We managed to escape after receiving 4 helps but a good number of people (around 25 groups out of 1,000) managed to escape without the need to ask for help. Just a piece of recommendation: it is better to go in 3/4 instead of 2. Sharing the tasks will reduce the time to decipher the clues and increases the chances to complete it without any external help. In two people, you cannot really work on different things, because there is the natural tendency to work in couple. The Escape Quest app, very popular on smart phones, can be an useful training to arrive prepared at the challenge. Definitely recommended. No Wikipedia, No Google, No technology can help you. Challenge your brain and see if you can escape. This entry was posted in Dubai, Quiz, Summer Activity and tagged Activity, Afternoon, Challenge, Clue, dubai, Escape Quest, Game, JLT, Summer, Use your brain on July 27, 2015 by andreadetto.